What are your top three priorities (this could be food, flowers, music or whatever)? Because the Berkshires has a wonderful variety of ceremony locations and reception sites, it's imperative to get a better understanding of what the couple is looking for. Do they want a modern wedding? Are they looking for a MA wedding venue that is full of history? Have they been dreaming of an outdoor wedding in the Berkshires? Would they prefer to host their wedding in a barn? Enjoy Wheatleigh as your own private estate for a weekend of festivities, from the prenuptial party, to the wedding dinner, to the farewell brunch. Chef Jeffrey Thompson will craft unique menus for every event. With attention to each detail and incomparable service from the first tasting through the departure of the last guest, Wheatleigh’s European trained staff will create the extraordinary wedding you envision. Be sure to check out this fabulous Wedding Weekend at Wheatleigh for a glimpse at some Berkshires wedding inspiration! Blantyre is an exceptional choice for weddings, any time of year. Situated on 114 acres of lush lawns and woodlands, Blantyre is a private sanctuary, resplendent with antique furnishings, luxurious appointments and beautiful floral arrangements. Their attentive and caring staff is poised to welcome your guests with a warmth and professionalism reminiscent of a gentler time of elegance and romance. A member of Relais & Chateaux and the Forbes Five Star hotel collection, this Tudor-style estate, built in 1902 is comprised of 23 guest accommodations, distinct reception and dining rooms, a tranquil, full service spa located in The Potting Shed and numerous on site activities. Renowned for its French-American cuisine, award winning wine cellar and attention to detail – bespoke, memorable events are created for an intimate guest list of two or two hundred. Exchange vows and mingle with loved ones against the backdrop of The Mount’s colorful, award-winning formal gardens or the elegant interior of Edith Wharton’s historic mansion. Spanning nearly 50 acres, the gracious, spectacular estate is the perfect setting for an unforgettable wedding. During your event, the entire estate is closed to the visiting public so you can host gatherings wherever you like on the property, and your guests can meander freely about. You can get a feel for just how much your guests will enjoy this property by viewing this post or this post. After your ceremony in one of The Mount's unique indoor or outdoor locations, you can host cocktails in the garden, dine in the formal rooms on the mansion’s main floor, and dance under the stars on the expansive terrace overlooking The Mount’s meticulously manicured property and the mountains beyond. Your guests are also invited to wander through the exhibits on the mansion’s third floor. Stonover Farm is truly a magical wedding setting, situated on 10 beautiful acres with a duck pond. The wedding couple has a choice of a 4-acre field for a tented wedding or a magnificent haybarn for a barn wedding. The hay barn can accommodate up to 200 for dinner and dancing. The field is large enough for any size tent, and the ceremony is typically held on the barn ramp, with guest seating on the lawn (although there are several locations on the property that would be perfect!). The lawn by the duck pond is a great spot for a post-ceremony, pre-dinner champagne or cocktail reception. Stonover Farm's luxury suites can accommodate up to 14 guests, with the bride and groom enjoying the spacious, private and superbly appointed School House Suite. Your other guests may stay at any number of local traditional B&B’s, all within a few miles. This Berkshires wedding barn is just two and a half hours from New York or Boston. It combines generosity of space with a feeling of intimacy – connected to a full complement of wedding service people, caterers, rentals, tents etc., the innkeepers are happy to host your unique and memorable country wedding. Gedney Farm is an ideal destination for a Berkshire wedding weekend. Located in the "Old Berkshire" village of New Marlboro, now a National Historic District, Gedney Farm is comprised of two Normandy-style barns, surrounded by 37 acres of pastures and high open meadows. The Event Barn, originally ahorse barn, has been renovated for use as a private event venue. The barn features three levels inside that all open up onto each other, and spill out through large sliding glass doors onto garden and courtyard areas where guests can enjoy late afternoon cocktails and hors d'oeuvres. Dinner and dancing take place inside the barn on the main and loft levels. The barn can accommodate up to 250 persons for a wedding event with additional space for band and dancing, and is fully equipped with AC and heat, so events take place at Gedney Farm throughout the year. MASS MoCA MASS MoCA offers some of the most dramatic and creative spaces in Berkshire County to host your wedding in the Berkshires – both indoors and outdoors. This 19th-century renovated factory setting (on the National Register of Historic Places), now home to an ever-changing collection of exciting contemporary art, provides a unique atmosphere while allowing you to customize the space to fit your own vision. With such a variety of spaces available, this museum wedding venue can host guest lists topping 500 or private, much-smaller events in some really unique settings. Selecting MASS MoCA as a site for your modern wedding reception, ceremony, seated dinner, or other special occasion is a unique way to support MASS MoCA while ensuring that your event has a distinctive cultural dimension. Have your wedding toast on the Rose Terrace, offering a 60-mile view of the surrounding hills in Lenox, Massachusetts. Feast at a wedding banquet for up to 200 in this historic 3,000 square-foot renovated Sloane's Ballroom featuring 16 foot high windows and panoramic views. Or plan an elegant tented outdoor wedding in the Berkshires. 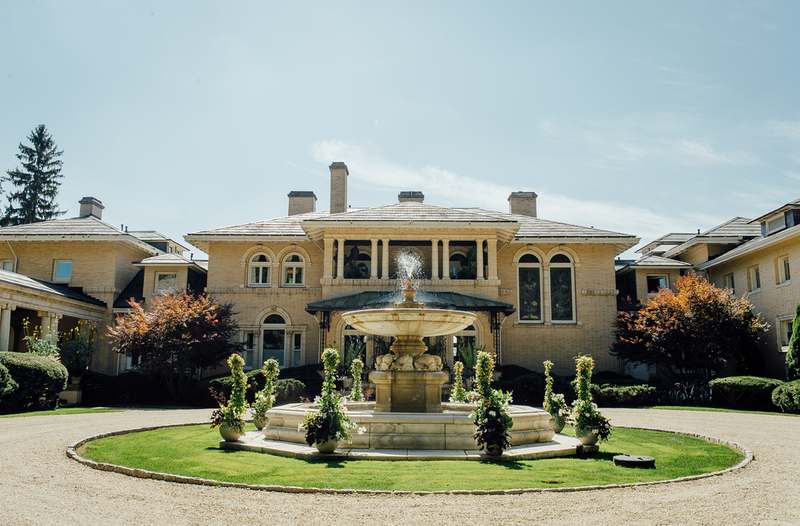 To begin the festivities, the Meadow View dining room terrace overlooks surrounding trees, providing the perfect setting for your rehearsal dinner, and their elegant mansion dining rooms offer bright settings ideal for a sumptuous departing brunch. If you love the romance of winter with cozy fireplaces and pristine scenery, your winter wedding at Cranwell Resort will be breathtaking. Nothing creates a deeper intimacy or a higher style than a winter wedding. Cranwell's winter weddings offer all the amenities that they provide throughout the rest of the year and the opportunity for you to enjoy a beautiful wedding at a reduced price. Experience Gilded-Age style and splendor at this marvelous estate, renowned for its elegant gardens and rare Berkshire “Cottage.” With its gracious house, magnificent gardens, and panoramic views, Naumkeag is a quintessential country estate of the Gilded Age. 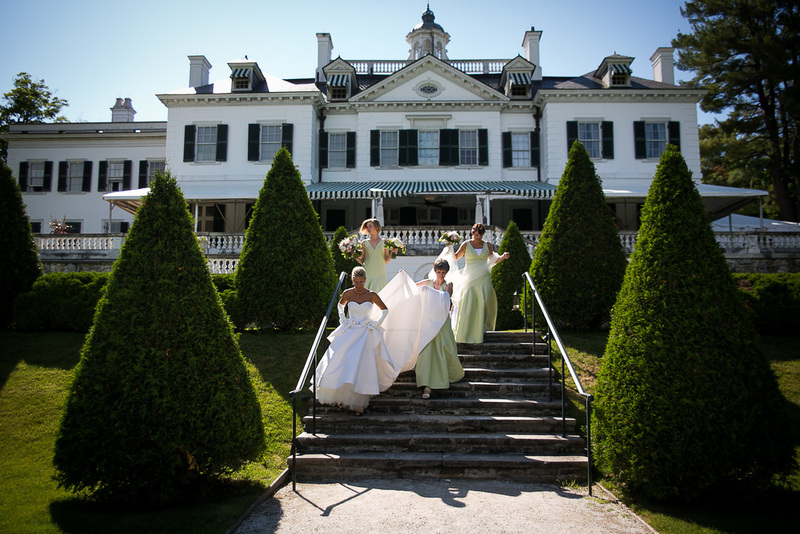 With its views of Monument Mountain, its stunning collection of gardens and its shingle-style house, Naumkeag creates an unforgettable experience for your wedding guests. Allow them to stroll through all of Naumkeag's gardens, including the Blue Steps, a series of deep blue fountain pools, flanked by four flights of stairs and a grove of white birches. Imagine your cocktail hour in the beautiful Afternoon Garden, your wedding tent set up in their Tree Peony Terrace, and your well-placed bars and food stations nestled in the Rose Garden, Evergreen Garden, and Chinese Garden to encounter the playful, inventive spirit of Miss Mabel Choate and Mr. Fletcher Steele. Hosting an event at Jacob’s Pillow means this unique history and atmosphere is forever connected to your special day. The Pillow is available for weddings and commitment ceremonies September through mid-May, and is especially popular during these months as fall foliage and spring breezes add breathtaking ambiance. Be sure to check out this fall wedding, where the guests danced until their feet failed them! And there you have it...whew! Just imagine how amazing your Berkshires wedding can be, whether planning a country wedding, a wedding with a Downton Abbey feel, or a wedding that takes place in an old mill setting. And just in case these 10 venues, weren't enough to peak your curiosity, I guess I should tell you that there are SO MANY more that I didn't even highlight! Want to discuss hosting your luxury wedding in the Berkshires? Be sure to comment below, or shoot me a line! I'd be more than happy to plan and design your special day!